Day after day, stories of the Israel Police's pro-Arab bias continue to stun the nation. This time: absurd scenes in Hevron, Jerusalem. Day after day, Israelis are exposed to new harrowing stories about Arab-on-Jew brutality and police pro-Arab bias. While most mainstream media fail to feature the stories prominently, or do not report them at all, they surface in free news media like Arutz Sheva and on certain blogs. The common theme in all of the stories is increasingly audacious Arab-on-Jew brutality and unfathomable police bias against the Jews involved - raising the suspicion that Israel's police - the one police force in the world Jews believed would never turn on them - have been successfully subverted by extremist elements. Two new stories were reported Wednesday: one in Hevron, the other in Jerusalem. In Hevron, nationalist activist Itamar Ben-Gvir was detained for interrogation after he attempted to chase down two Arab youths who had brandished sticks and menacingly approached a car he was in. "This was one of the most hallucinatory stories I have been in," Ben Gvir told Arutz Sheva. "We held a march in Hevron to welcome a Torah scroll that was dedicated to Jonathan Pollard. I hitched a ride with someone when we suddenly saw two Arabs coming close to our car, standing with sticks in their hands and raising the sticks." "A Border Policeman who stood next to our car did nothing and it was clear to me that if I do not do something all of the windows will be smashed, so I ran after them and the policeman started chasing after me and arrested me instead of arresting them, and claimed that they hadn't hurt me and matters hadn't gotten out of control." "When I was taken to the Hevron police station, the policemen asked the Border Police what happened and they told them their version. The stations policemen asked them why they didn't arrest the Arabs and suddenly, in the questioning, the Border Police forgot to tell what had happened with the sticks." "This is a phenomenon of a culture of lies - a pattern of police behavior that we are familiar with, unfortunately," Ben Gvir said. "This is not the first time that Border Police lie and even more worrisome is the behavior of the Border Policeman on the ground who arrested me instead of arresting them." Ben Gvir said the incident was a sign of "moral bankruptcy" and said that "since this has become a systematic problem, I will have no choice but to sue these policemen so that they explain in court why they behaved as they did." Ben Gvir said that the problem starts at the top of the power echelon, with the Minister of Public Security, Yitzchak Aharonovich (Israel is Our Home). Aharonovich's insistence on daily confrontations with Jewish settlers trickles down to the lower ranks of the police, he accused. However, the problem does not exist only in Judea and Samaria, where "settlers" are involved. 'Hallucination' #2: Wadi Joz - Not for Jews? Two Jews were arrested near the Old City of Jerusalem Tuesday, as they made their way to the monthly Circling of the Gates. 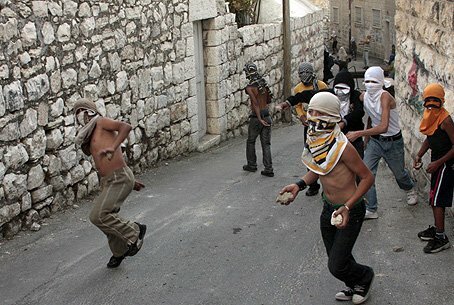 The two-one from Jerusalem, the other from Binyamin - were driving through Wadi Joz when two Arab vehicles began chasing them. Near the Lions' Gate, the Arabs overtook the Jews' vehicle and blocked it. Several Arabs came out of the cars, and began saying that the Jewish car had hit one of their cars. More Arabs began to crowd around the group and A., the Jewish driver, called out to police who were standing nearby and complained that the Arabs were threatening him and blocking his car. He made clear that he had never hit the Arab vehicle. According to the Honenu organization, the police decided to believe the Arabs, and carried out a search in the Jews' car. They even called a police bomb-remover to check the car for explosives, as the Jewish owners stood by, dumbstruck. The two were then arrested for obstructing a police officer and holding "racist incitement literature." Ironically, the supposed "incitement literature" consisted of a report by the Human Rights in Yesha organization that detailed police bias against Jewish settlers. The two were held overnight and brought before a judge for arraignment Wednesday morning. An Arab police investigator, Harb Kaher, presented secret material to the court and asked that the two be detained for an additional 48 hours. He said that "the event occurred in eastern Jerusalem and the suspects have no reason to be there. They said that they were en route to the Kotel but that is not a common route to the Kotel." Attorney David Halevy, who represented the two on behalf of Honenu, explained that Wadi Joz is a common route to the Kotel. He added that no place in the country is off limits to Jews, and that this holds doubly true for the capital, Jerusalem. Halevy said that the two had been beaten by the arresting policeman, whose identity they did not know, but Kaher refused to give the policeman's personal details. Judge Irit Cohen released the two on bail.